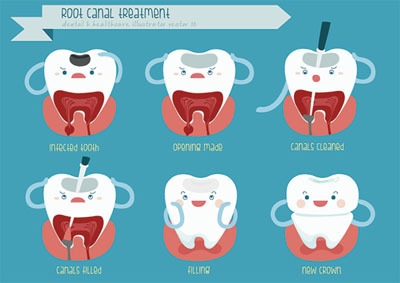 Root canal therapy, usually referred to as a root canal, focuses on treating the inside of a tooth. Teeth consist of a visible outer layer of white enamel and a hard secondary layer called dentin. Both of these layers surround the dental pulp, which is the soft tissue that lies at the very heart of each tooth and is made up of a network of living connective tissue, nerves, and cells. If a tooth has been injured, chipped or cracked, or if it has become diseased to the point that the bacteria reaches and infects the dental pulp, the only thing that will save the tooth is root canal therapy. If dental pulp has become infected, it has to be removed. Root canals are the more common endodontic treatment that we regularly perform because they are the only way to remove the infected pulp while preserving the natural tooth. While teeth are growing and developing, dental pulp plays a vital role in nourishing the tooth. However, after the tooth has matured, it can be sufficiently nourished by the surrounding tissues and can survive without the pulp. When root canal therapy is performed, the nerve and infected dental pulp are removed, and the interior part of the tooth is cleaned and sealed. The tooth is then finished and restored with a crown or filling. Root canal procedures have the reputation of being extremely painful. However, many people report that the it is actually no more uncomfortable than a routine filling, although it does take more time to complete. For the first few days following the completion of a root canal, the tooth may feel sensitive or a little tender due to natural tissue inflammation, especially if there was pain or infection present before the procedure. This discomfort lasts for a short time and usually can be controlled with over-the-counter pain medications. The American Association of Endodontists state that root canal treatments save more than 17 million teeth per year. With proper care, root canals can last a lifetime. The nerves and dental pulp within a tooth can become irritated, inflamed, and/or infected due to severe decay, fillings that are too large, repeated dental procedures on a tooth, a crack or chip in the tooth, or in cases where the face has sustained trauma. While the signs mentioned above are some of the more obvious ones, there are also some less apparent ones that only an experienced endodontist (dentist who specializes and focuses in root canal therapy) will be able to locate and successfully treat. Because the pain caused by a damaged or diseased tooth is often felt in another tooth, or even in various parts of the head, neck, or ears, it is not always possible to pinpoint which tooth has become decayed. If you are experiencing any of these signs, contact your Torrance} dentist at (310) 747-6532 for a thorough examination. The only alternative to root canal therapy is having the damaged tooth completely extracted which would then be replaced with a bridge, partial denture, or an implant. All of these alternatives are more expensive, involve more treatment time and additional procedures to adjacent teeth.